This guys wolf has more hp than him, pathetic! Ok, if I'm right, this guy's name is derived from Jotun, wich means "giant", in ancient nordic. Fitting, wouldn't you say? Jotunheim in Icecrown is derived from, well, Jotunheim in nordic myths, wich meant "Home of the Giant"
Where is this guy located? I dont see him anywhere. I dont see the guy (or anvil) that supposedly gives the qst Hot and Cold either. I can confirm myself that upon killing him, and his pet, NO reputation will be lost or gained with his faction. Edit - Less unnecessary info. 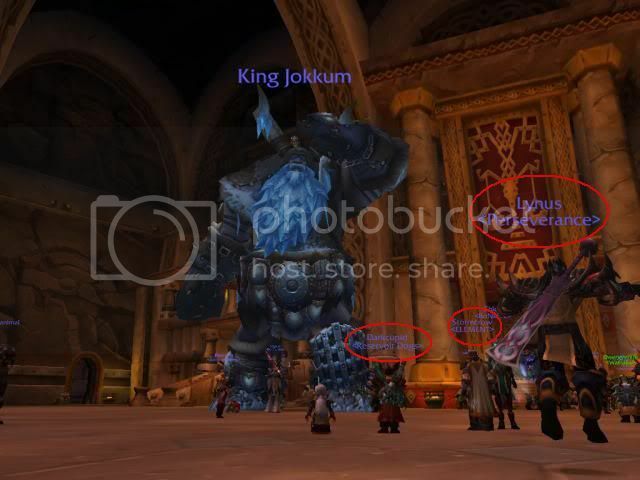 Has recently been sighted as far south as Ironforge. Found this bug by an accident but i eventually raided orgrimmar with it. It had no special attacks and but he was great fun in the arena anyway. Edit: about 150% speed, 3K hits,could be buffed (kings etc), immume to falling damage and he could breath underwater. Just a regular elite. But... he was unable to jump :/ !. You have just won the internet. After you do "you have to do the entire line starting with They Took Our Men and ending with two quests from thorim (Mending Fences)" you will have a quest item Slag Covered Metal in your bags which drops off Stormforged Iron Giants. Finishing those two quests gives additional reputation for Sons fo Hodir and makes you revered among them. Only then you can see King Jokkum.